Whether it’s the authentic wood-burning stone fireplace, the fresh panini sandwiches or the opportunity to sample exclusive wines, Café Caturra in Cary is a unique fast-casual concept. Additional perks include hand-roasted coffee, free Wi-Fi Internet access and an atmosphere where lingering is encouraged and expected. Among the tempting food selections, the made-from-scratch soups stand apart. The satisfying options include roasted red pepper goat cheese bisque; tomato basil with brie; Thai chicken noodle; curry chicken and green apple; and maple habanero chili. 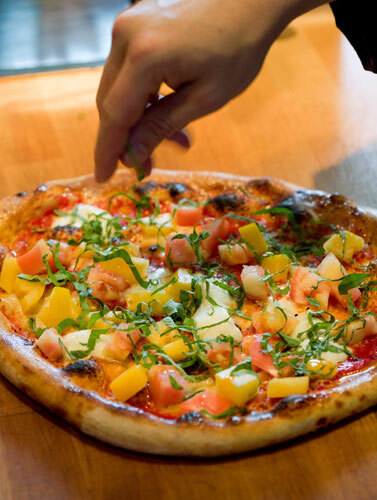 Main course options are equally impressive, whether you choose a gourmet salad (think raspberry walnut), a specialty sandwich served on bread from nearby La Farm Bakery or a homemade Neapolitan-style pizza baked in a wood-fired oven. A wine fair menu section contains items like pan-seared crab cake sliders, delectable mini burgers and heirloom tomato penne pasta. Generally served during evening hours, the wine fair features several plates that are ideal for sharing. An impressive meat and cheese board, for example, features hand-cut meats, artisan cheeses, fruit and olives and is sizable enough for at least two people. Café Caturra offers a boutique selection of white and red wine from all over the world. Elegant varietals from Spain, France, Italy and elsewhere are available, and wine is kept at just the right temperature in the café’s environmentally controlled storage system. This ensures that the whites stay crisp and the reds remain rich. A healthy alternative to the caloric end-of-meal splurge comes in the form of mini desserts. You can’t go wrong with a chocolate torte or crème brûlée. When it comes to décor, Café Caturra’s reclaimed wood tables, leather banquettes and local artwork provide just the right touches of warmth and stylishness. No wonder people like to linger here.